A whole load of these Penn spinning reels seem perfectly suited to our lure fishing and I find myself using them more and more these days. An absolute machine of a spinning reel, and serious amount of reel for the money. Nice and smooth but slightly heavier than the equivalent 4000 size Shimano reel, this Penn Slammer III 3500 is a workhorse that gives me so much confidence against the (saltwater) elements ruining it. Initial thoughts here. Full review here. You can buy this reel here and here in the UK (Ebay link). Spinning reel of the year 2018. 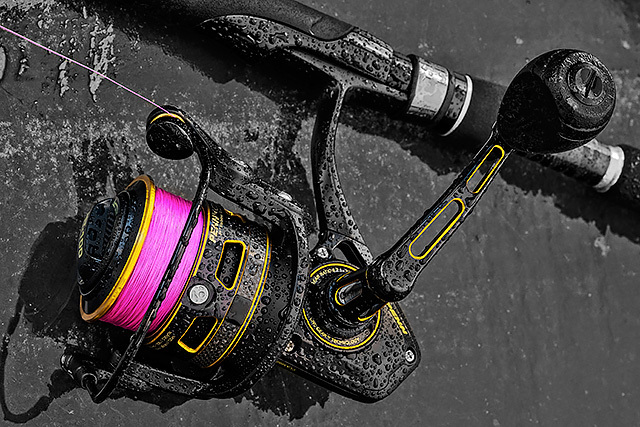 The same body size as the Penn Slammer III 3500, but this slightly heavier 4500 version has a larger spool and bale-arm - the perfect surf fishing reel? I feel like I could pull the plug out of the sea with these Slammers. Awesome. Review of the smaller 3500 version here. Available here in the UK. The game-changer? The same size as a Shimano 3000, this stunning little and “budget” Penn Spinfisher VI 2500 is rated IPX5 against saltwater intrusion. Time will tell, but if this thing continues to fish as well as it is then it’s more than likely going to change my outlook on smaller spinning reels for the light and responsive lure rods I so like. Initial thoughts here. Available here in the UK (Ebay link). Cheaper and slightly tighter and lighter than the Penn Slammer III 3500, this Penn Spinfisher VI 3500 I believe still offers the same level of waterproofing. The same size as a Shimano 4000, this reel is an absolute joy to fish with. I’ll review it when I’ve had a lot longer with it, but initial impressions here are that this reel is serious value for money. What’s not to like? Available here and here in the UK (Ebay link). As with the equivalent Slammer, this Penn Spinfisher VI 4500 has the same body size as the 3500, but with a larger capacity spool and therefore bale-arm. Initial impressions here, and if this thing continues to fish this well then I can’t think of another spinning reel out there that offers so much value for money. Size wise, this Penn Clash 3000 is essentially the same size as a Shimano 4000 or Daiwa 3000 spinning reel. Check out my initial impressions blog post about it here, and an update on how the reel is doing here. Does not come with a spare spool. Full blog review here. You can find this reel here in the UK (Ebay link).